After two-long-years, the makers of the magnum opus Baahubali: The Conclusion, have finally released the theatrical trailer from the film, which is creating waves on the internet. While the world awaits an answer to the most sought-after question, Rajamouli has presented the coveted sword of Katappa that killed Baahubali to filmmaker Karan Johar, for his association with the franchise. The trailer launch of Baahubali: The Conclusion happened in Mumbai, where the makers showcased the much-awaited trailer cut to the audience. 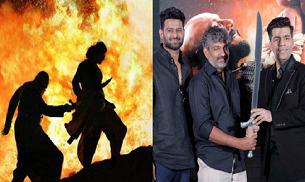 Actors Prabhas and Rana Daggubati, producers Shobu Yarlagadda and Prasad Devineni along with Rajamouli and Karan Johar were present at the trailer launch. Baahubali: The Beginning, which hit the screens in 2015, was highly successful and grossed Rs 600 crore worldwide. Speaking at the India Today Conclave South 2017, SS Rajamouli revealed that Baahubali 2 would be bigger and better than Baahubali. Also starring Rana Daggubati, Anushka Shetty, Tamannaah, Sathyaraj and Nassar, Baahubali: The Conclusion will hit the screens on April 28.